IT'S REVEAL DAY! WHOOP!! If you've come over from Lisa Dawsons' blog (thank you and HELLO to any new readers! ), how AMAZING is her bathroom?! A hard act to follow that's for sure! 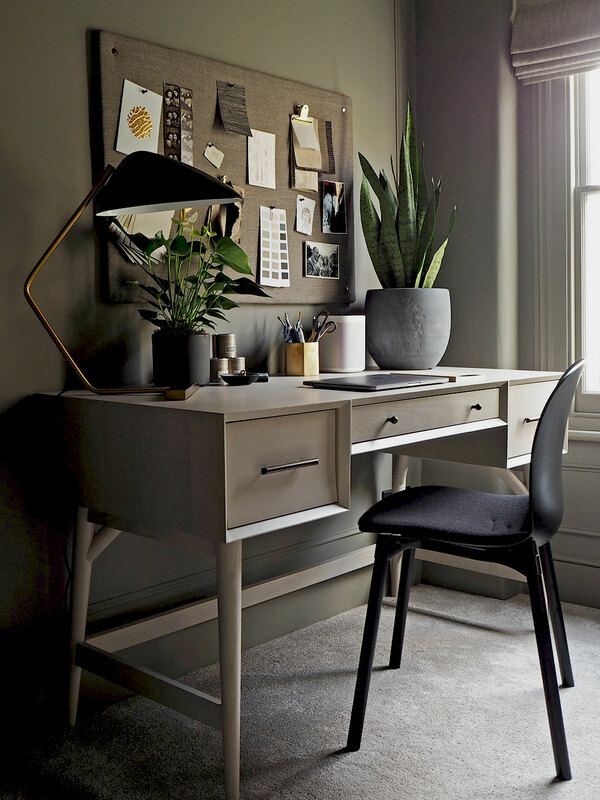 It's so exciting to be Revealing my new study come guest room today, alongside nine other supremely talented bloggers. 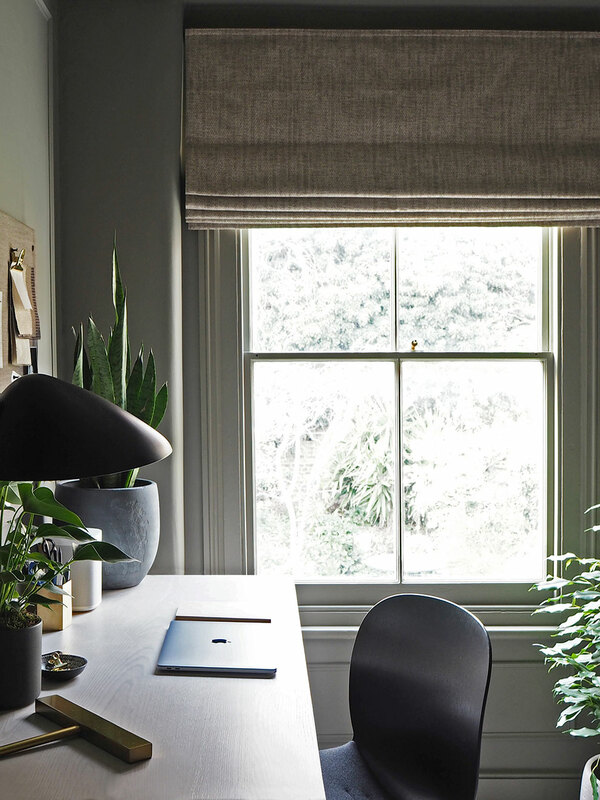 I should start by saying that there was nothing 'wrong' with this room, but my son Baxter had moved into a different room upstairs in the loft conversion, that used to be the guest room, and the plan was for this room to become a cosy study that doubles as a guest room. You can see what it used to look like when it was Baxter's bedroom here. I had given up my office and had been working here there and everywhere around the house, but it just wasn't conducive to getting work done - I'm easily distracted, so a designated work zone really is necessary for me, so this room needed to be a dual-purpose, hard-working room, in spite of its size (which is approximately 2.5m x 3m). Despite the fact that the photos would have you believe that this room is bright and light, in reality, it's quite a dark room that often feels dingy depending on the levels of natural light on a given day. I wanted to go with a neutral palette in here so that it felt more cohesive with the rest of the house which has been heading that way over the last year or two, but feared that a pale neutral would just look grubby and not at all help with the dingy-factor (technical term, obvs!). I'm not a fan of dark interiors generally speaking, though I love many a dark room in photographs, my real life experience of them has not been positive. 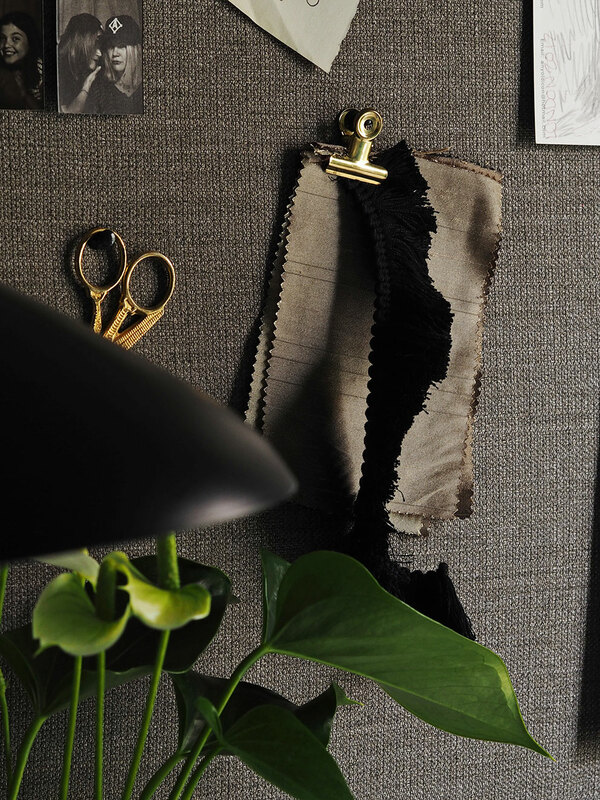 My short-lived black bedroom was a huge mistake from the get-go, and I felt like I was living in a depressing cave more than a chic bedroom. And lets face it, I do actually live in my house, so although I obviously like it to look good in photos, I need to feel happy in it too. I suspect that's why the move back to the light side has begun if my instagram feed is anything to go by, but that's a whole other story. Or blog post as the case may be. 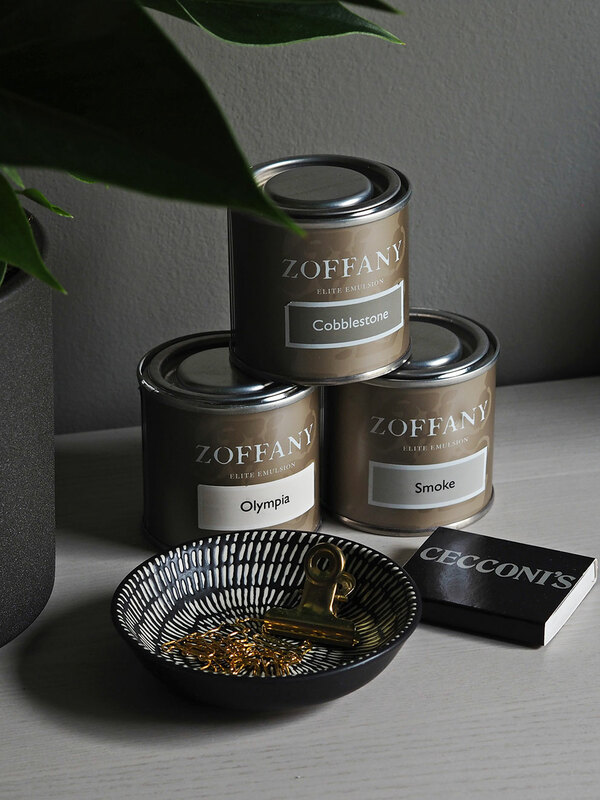 But this room was crying out for a dark colour - they definitely have their place, so I opened my mind to it again and took a look at the darker tones that Zoffany had to offer. Besides, the two rooms I'd previously painted dark and really not liked were both South facing rooms with abundant natural, light, not north facing darker rooms, so I took the plunge! 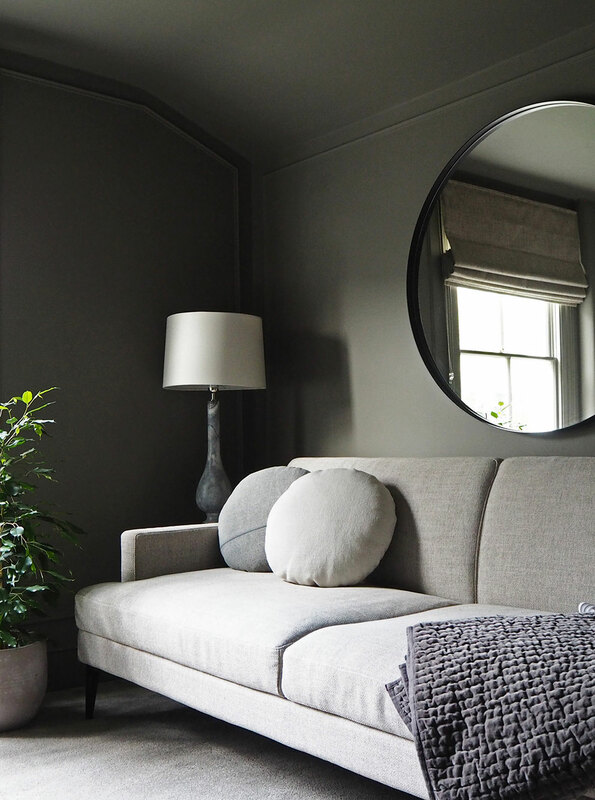 The current theory in paint colour choices is that you should work with and not against the natural light available in any room, so keep naturally lighter rooms light, and go darker where there is less natural light. 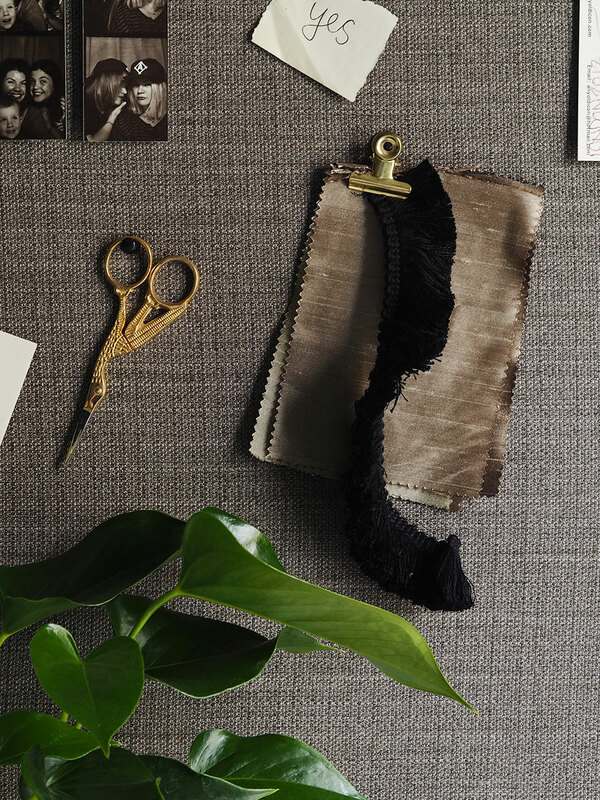 I fell in love with this chocolatey brown called Cobblestone by Zoffany. 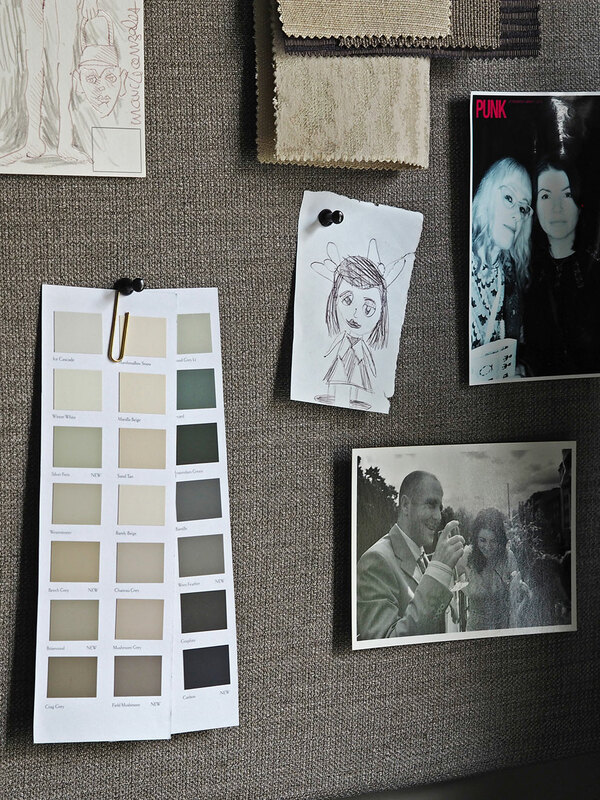 It's a beautiful colour that can look grey or deep olive in different lights. It's simply stunning, and once I found it, I knew I was on the right track and my doubts totally disappeared. It's actually not super super dark, but it does make the room feel really cosy and inviting. Once I stripped all the wallpaper and prepped the walls, I painted the colour all over - a colour wash of the lovely Cobblestone. 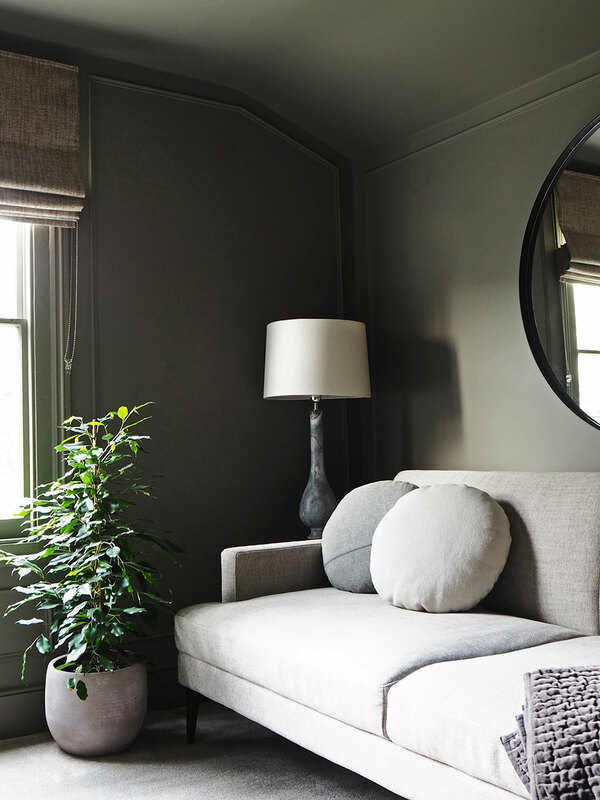 The ceiling is low and slopes above the sofa, and there is no cornicing, so painting it all the same colour makes the ceiling blend in rather than having a high contrast white ceiling which would be distracting in this room. I also painted all the woodwork in the Acrylic Eggshell version of the same colour, and I have to say that Zoffany paint is a dream to use. Amazing coverage and even the Acrylic Eggshell wasn't in the least bit sticky. Two coats on everything did the trick! I was ridiculously excited to get rid of the old radiator and replace it with this absolute beauty from soak.com. 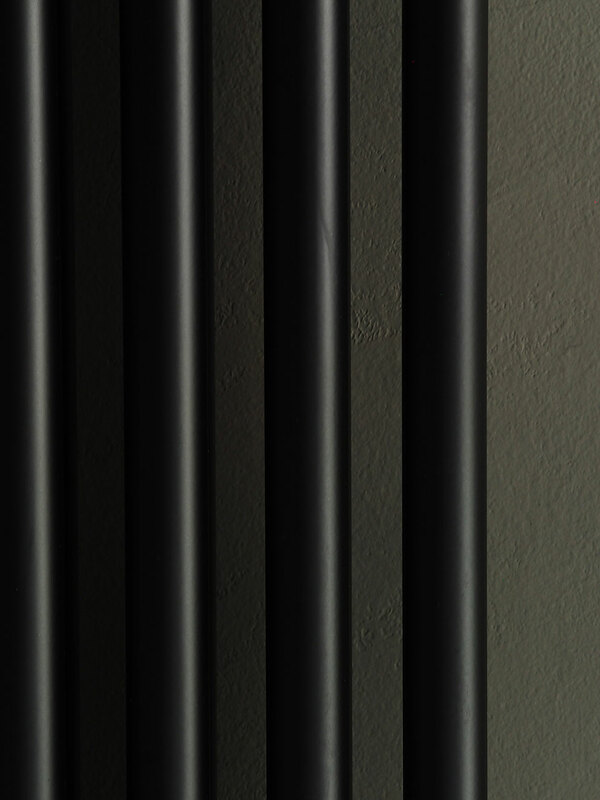 This is a relatively new addition to their already great range of radiators and I just love the black finish which is perfect against the Cobblestone walls. This room has always been noticeably colder than any other room in the house with it's two external walls, single glazing and probably not enough insulation anywhere including the roof. It's positively warm and cosy now, and that makes me very happy indeed. Then it was time to start bringing in the furniture. I breathed a massive sigh of relief when the sofa was delivered and did indeed fit through the door - with a whole centimetre to spare. PHEW! I chose the stunning Andes Futon Sofa Bed from West Elm our headline sponsor, and not only is it a beautiful shape, and the perfect foil to the dark walls, with a creamy/grey flecked fabric, but it has a 'click-clack' mechanism allowing the back to lie completely flat to be used as a double guest bed. I also like the idea of being able to work from the sofa in if I don't feel like sitting at my desk, but still being in my work zone. 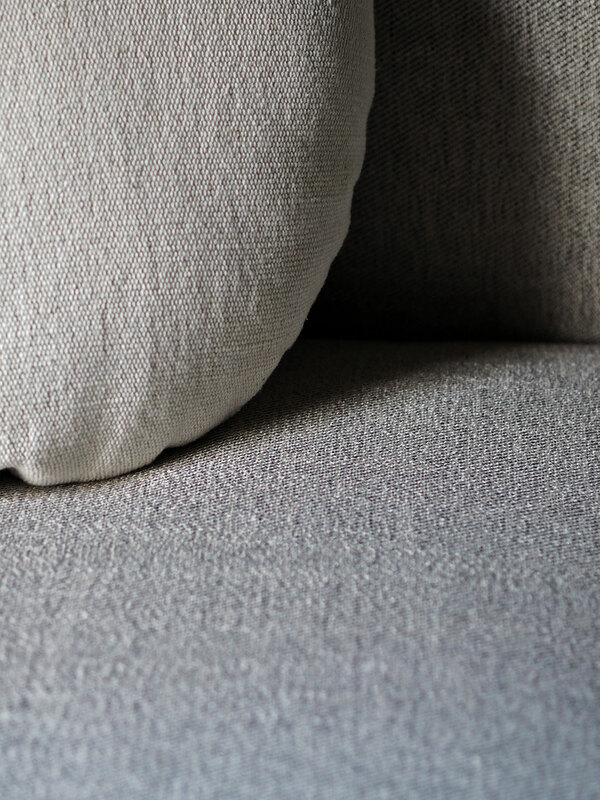 It was love at first sight with the round cushions which finish it off nicely, adding that extra bit of comfort and interest, but keeping the tones similar means it doesn't feel at all busy. Calm and cosy is the name of the game in this room. 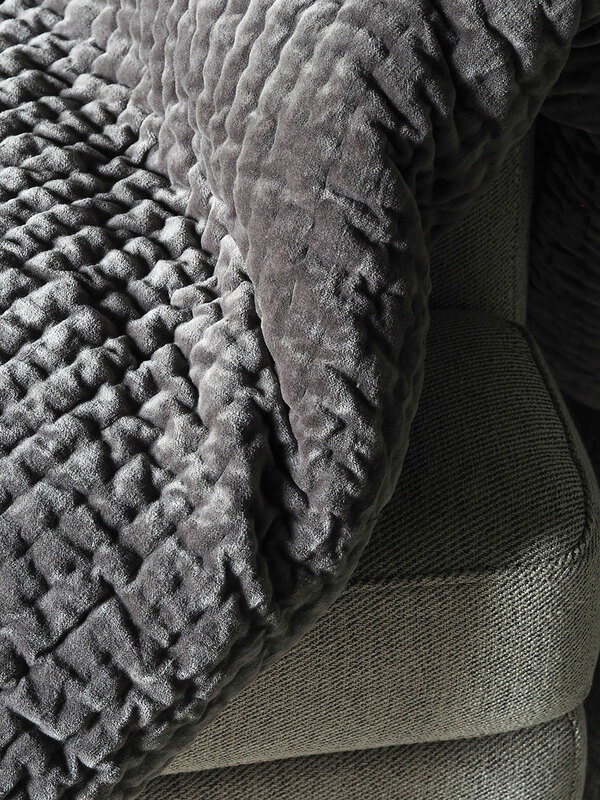 The beautiful quilted blanket is by Harlequin from the Style Library, and I predict arguments over it already - between me, the cat and the kids. 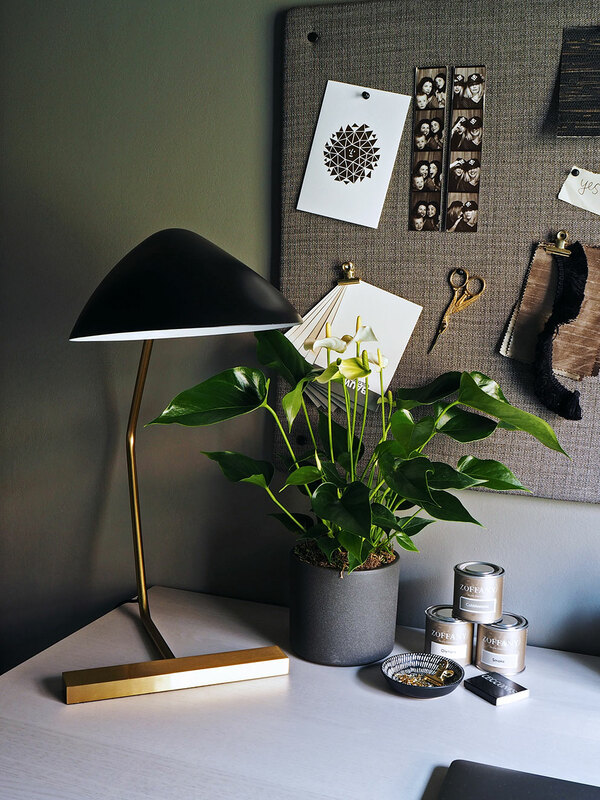 And speaking of my desk, I'm quite besotted with this gorgeous mid-century style number that ticks all my boxes. Desks are quite tricky I think, and I wanted something that was a good size, with some drawers, but that didn't feel too heavy in the room. 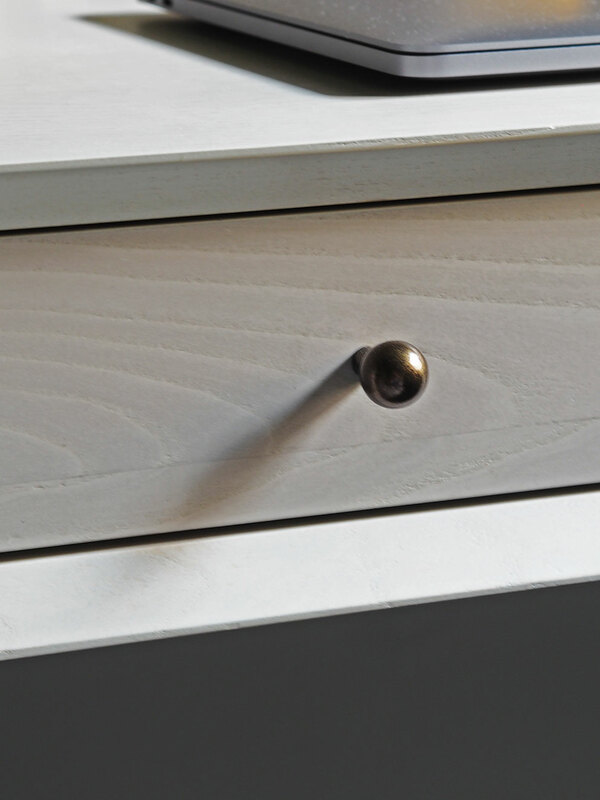 This is perfect and I love this new 'Pebble' colour too - a beautiful beigey-grey with the most beautiful grain, and the hardware is an antique bronze finish that just oozes quiet grown-up glam. Perfect. 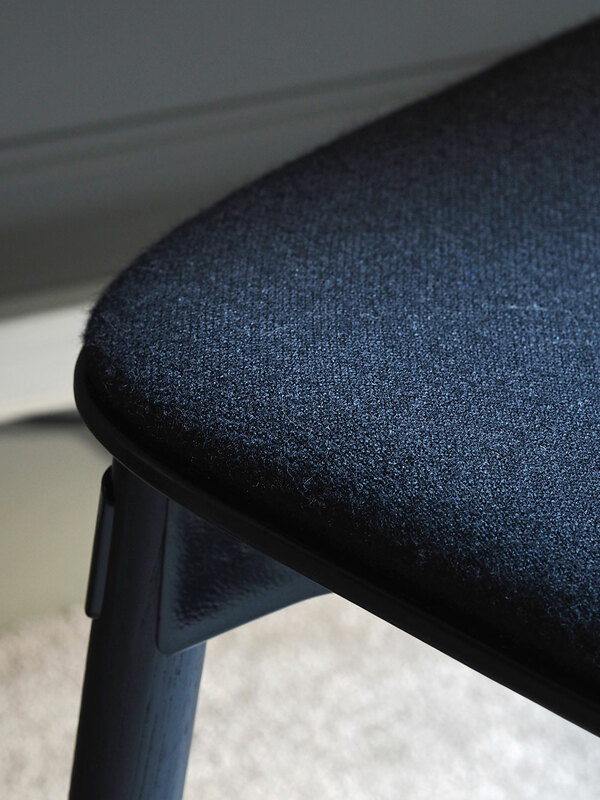 I couldn't be happier with my new RBM Noor desk chair from Flokk, it's SO comfortable, and such a gorgeous shape - the woodgrain being off-set beautifully by the wool seat. 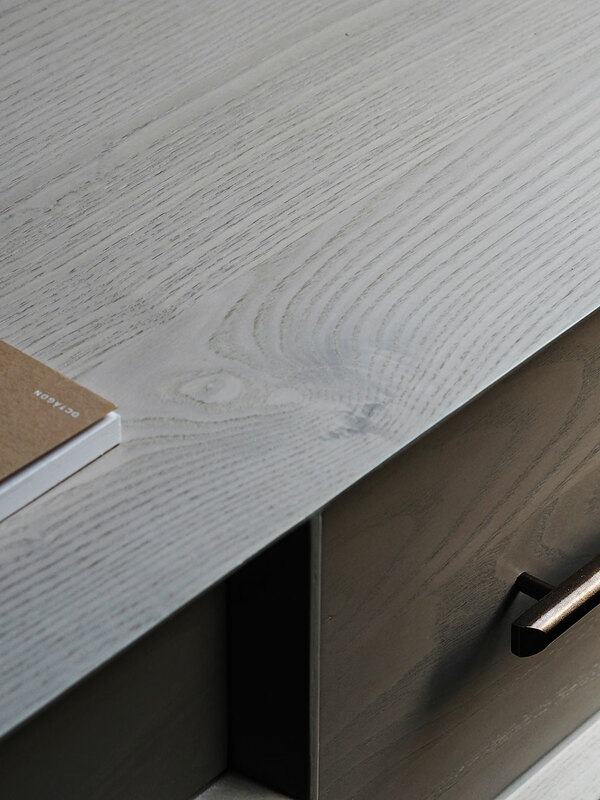 Black aluminium connects the base and legs and has a just a hint of the industrial about it - such a gorgeous piece. Flokk has a brilliant configuration platform, so you can design your own dream chair and see exactly how it will look, choosing from 14 shell colours, loads of different fabrics, and various leg options too - it's such a cool tool. 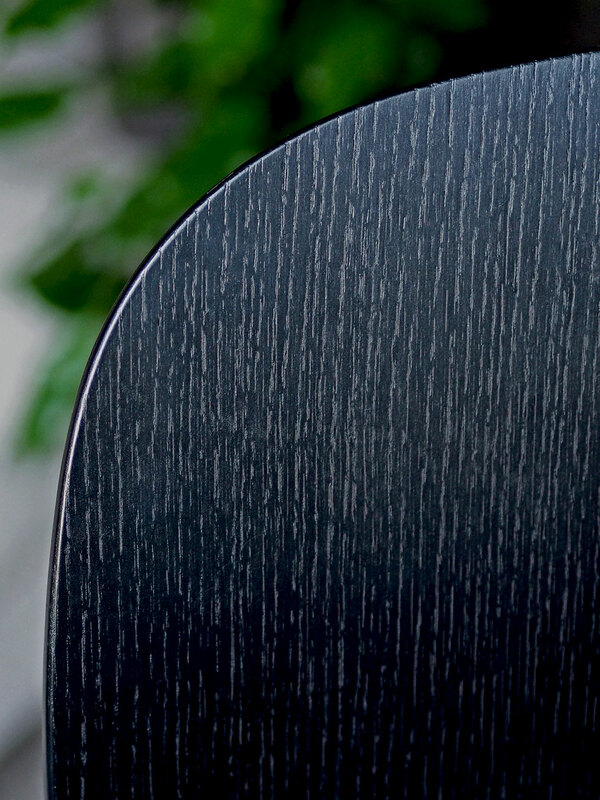 They're also really passionate about sustainability, so the chairs are made from recycled and recyclable materials. Sat upon my desk is a white Sonos One speaker which makes me very happy indeed. I'm not exaggerating when I say that Sonos speakers have changed my life. I may be behind the technological times, but music streaming really does still blow my mind! 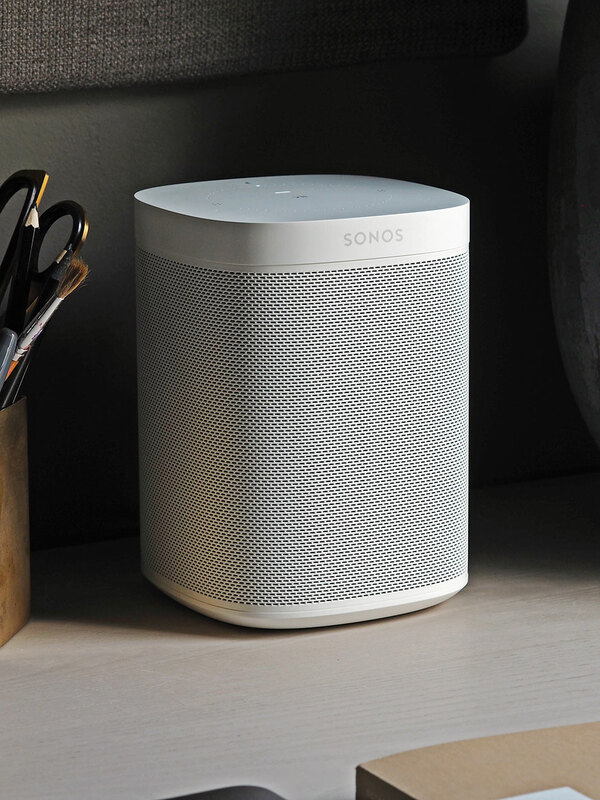 Now that we have a Sonos One in the study, I can link it with the kitchen and living room speakers to have my music streaming throughout if I want to. They're super easy to link and unlink (literally just hold the play/pause button down for a second or two), meaning that Ed can listen to his Talk Sport in the kitchen, and more importantly, that I don't have to. 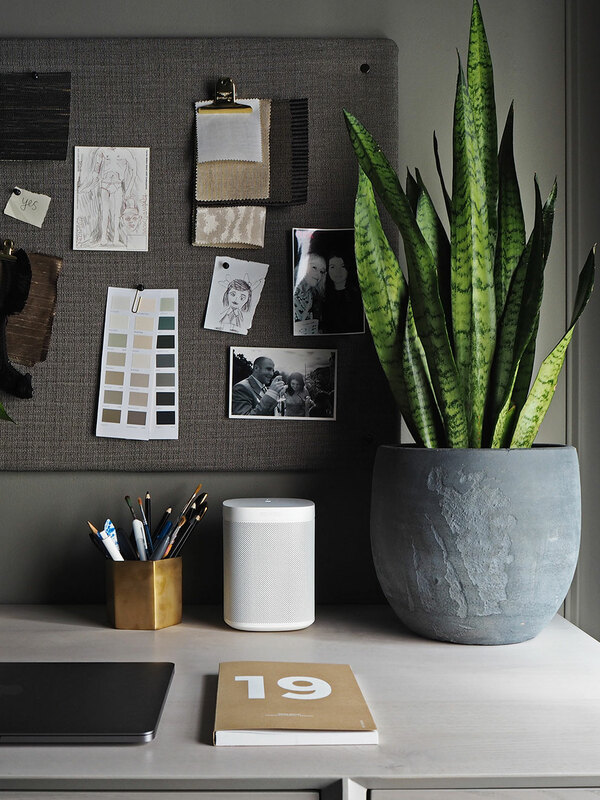 The Sonos one also has built-in Alexa so it's the perfect painting companion with hands-free music control - not to mention saving ones sanity! It was so important to get the lighting right in this room. With the dark walls, I wanted it to feel cocooning at night, with several light sources. 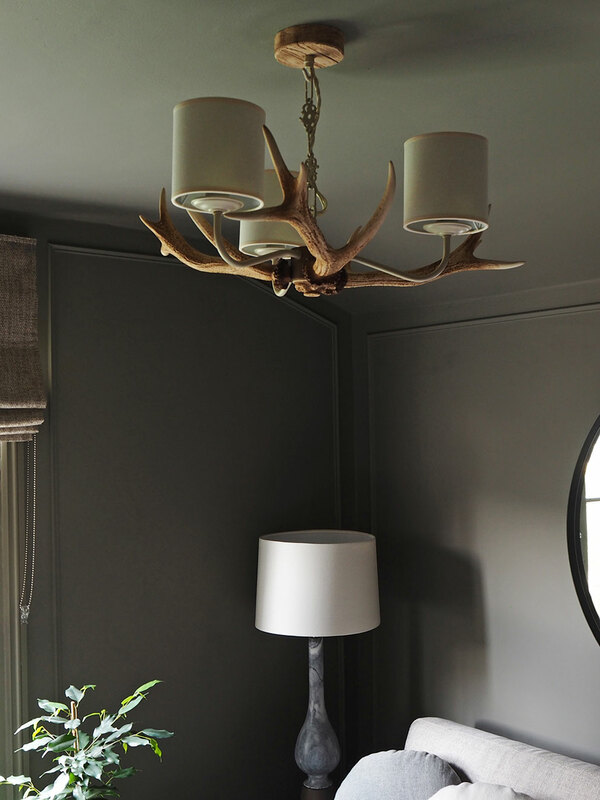 My electrician replaced the previous pendant with a three armed Antler pendant from David Hunt Lighting (check out their website for a really cool video demonstrating how the make the 'Antlers' - so fascinating). 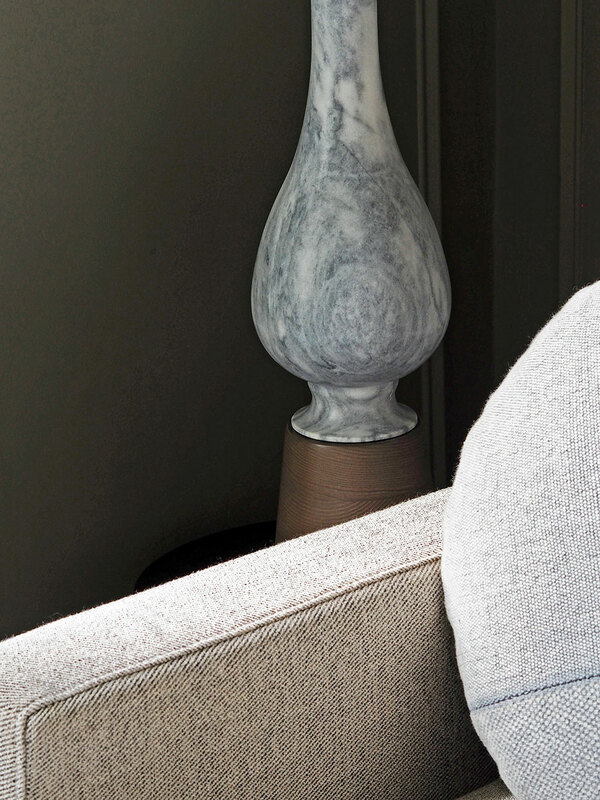 In one corner I added the absolutely stunning Apache marble lamp also from David Hunt which is teamed with an Ivory linen shade from The Light Shade Studio - a match made in heaven! It's probably wrong to love a lamp as much as I love this one. 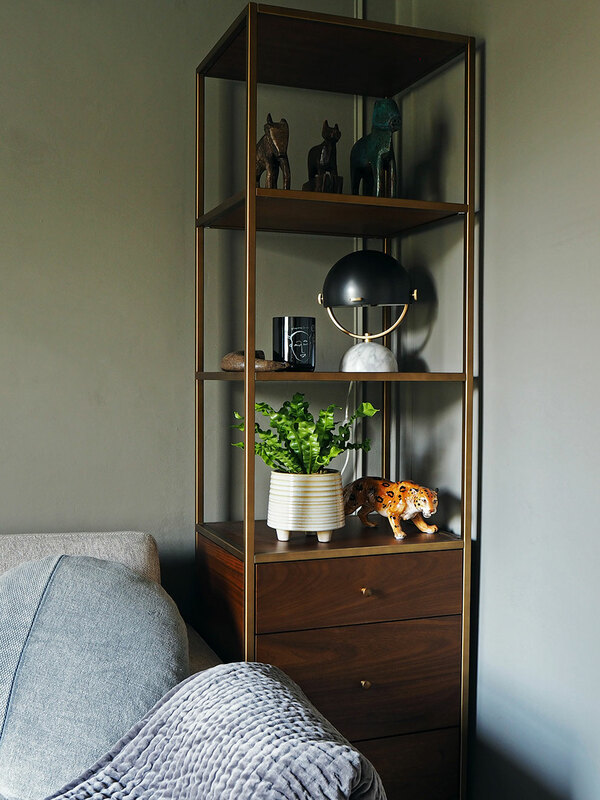 There's a gorgeous little 'Clint' lamp from West Elm on the Mid Century storage tower in the opposite corner (the unit has the added bonus of three drawers under the three shelves for more storage) and my desk lamp too. Not going to lie, I keep getting distracted from my work because it's so damn lovely to look at. See? Lamp addiction issues. 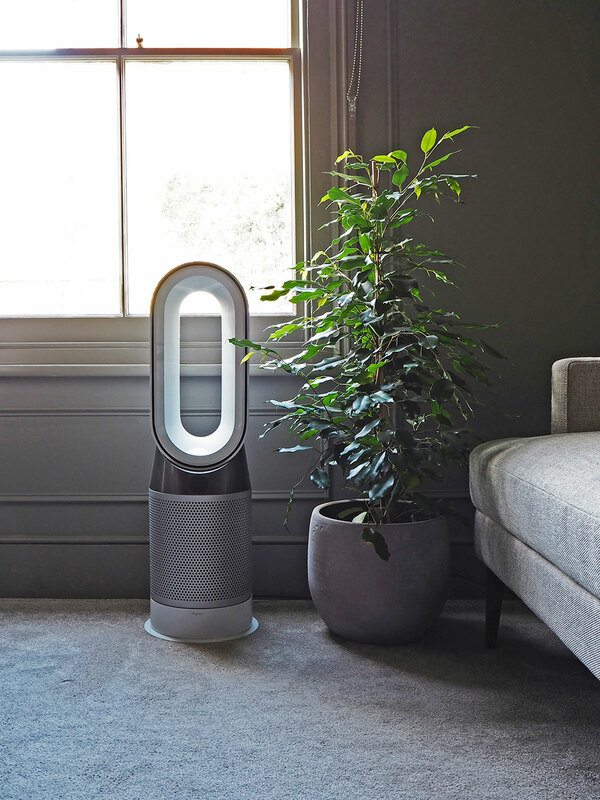 The Hot and Cold Dyson fan from ao is a god-send. 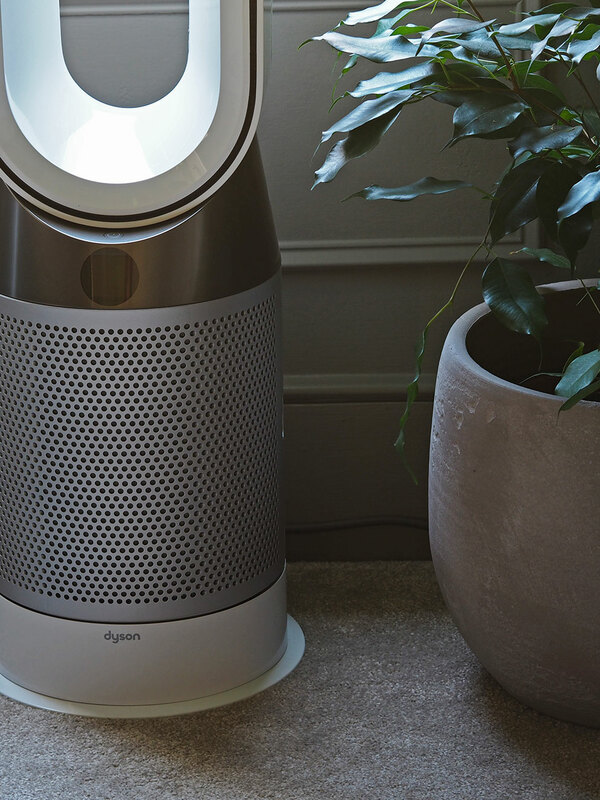 Not only is it VERY handily a heater and a cooling fan, but it's an air purifier too. And a very clever one at that. 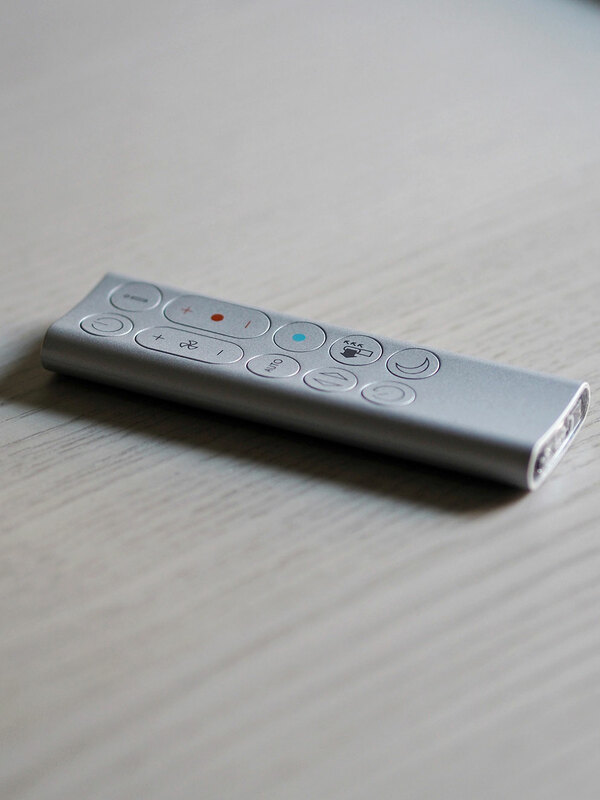 It can tell you exactly what pollutants it has taken from the air via the app. Amazing technology. 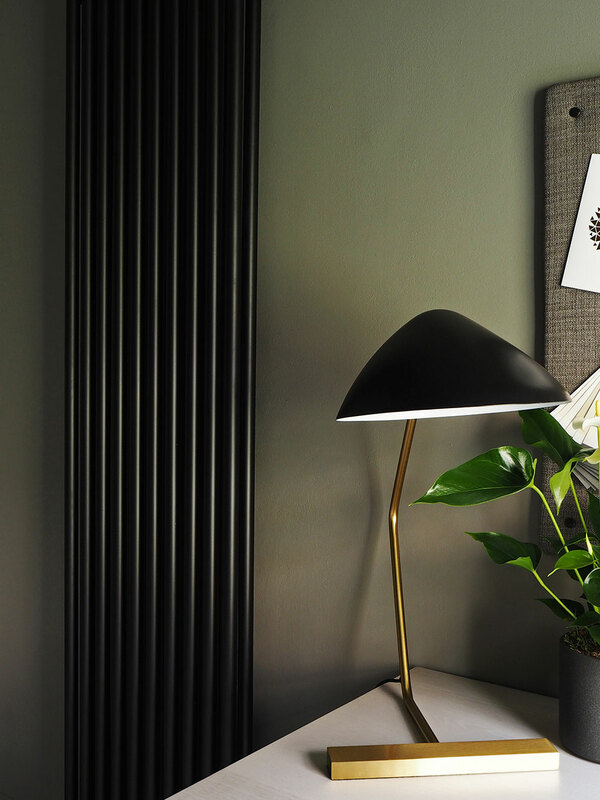 I love the fact that it's instant heat - especially handy when you can't wait for the heating to warm the room up on those freezing winter mornings, and of course to cool it down when summer finally hits. 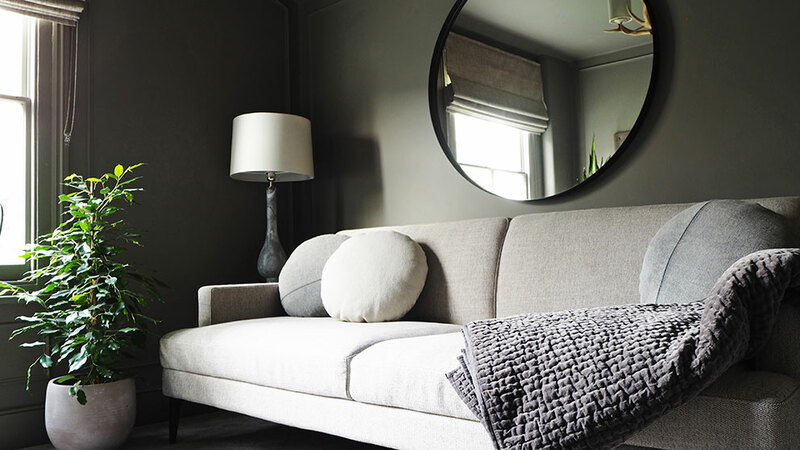 To throw some more light around, we have the oversized Iris mirror also from soak.com above the sofa. It instantly made the room feel twice the size. Ah the magic of mirrors! And its black metal frame ties in with the finish of the radiator too. And of course, light is is important, but so is darkness and privacy. As this room will also double as a guest room, so I needed a lovely window covering and The Blind Shop came to the rescue. 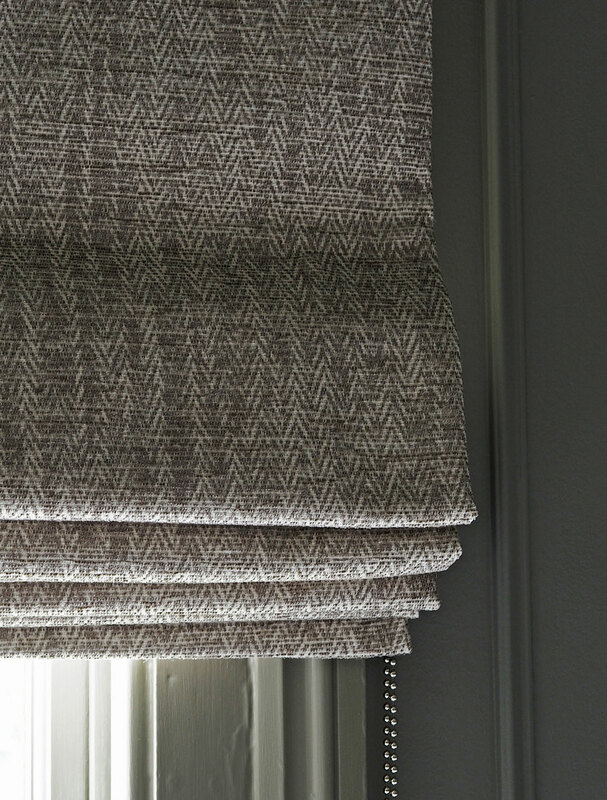 I chose a beautiful heavy herringbone fabric in the 'Seashell' colour and it's perfect with the other tones in the room. It's blackout lined and I had it made slightly wider than the window frame and installed above, so that it makes the window look bigger and doesn't block out any light when pulled right up. It's so well made and finishes off the room so beautifully. 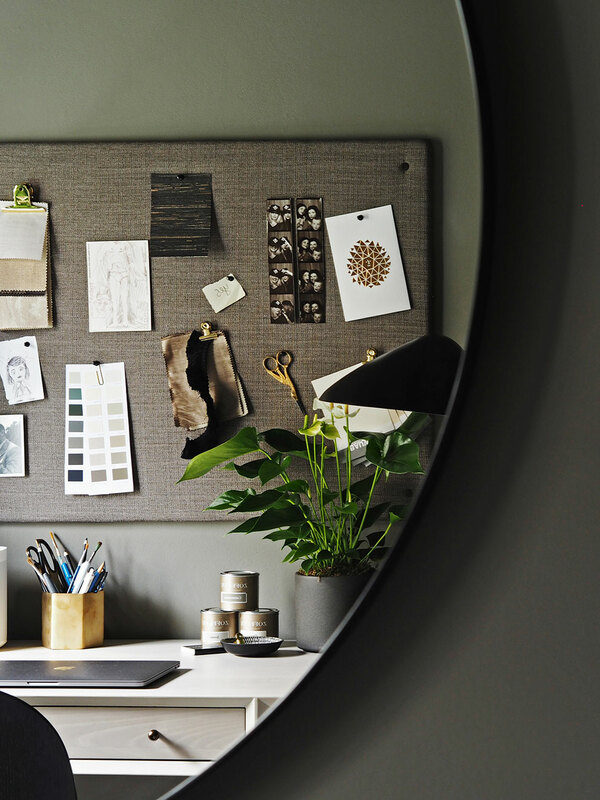 At the eleventh hour I decided that I needed a pin-board above my desk, for both inspiration and organisational purposes, but most pin-boards are so ugly! I was in the process of making a wall of fabric covered pin-boards for Baxter's new bedroom and had some of the board left over, so I decided to make a smaller one for my study too. I cut a piece of insulation board to around 60 x 90 cms, and covered it in a textured Prism Plain from Harlequin at Style Library in Particle Safari which again tones in with the wall colour beautifully. I secured it to the wall with mirror screws and screw caps in a bronze finish to hid the screws and I'm so happy with how it turned out. Such a satisfying DIY. 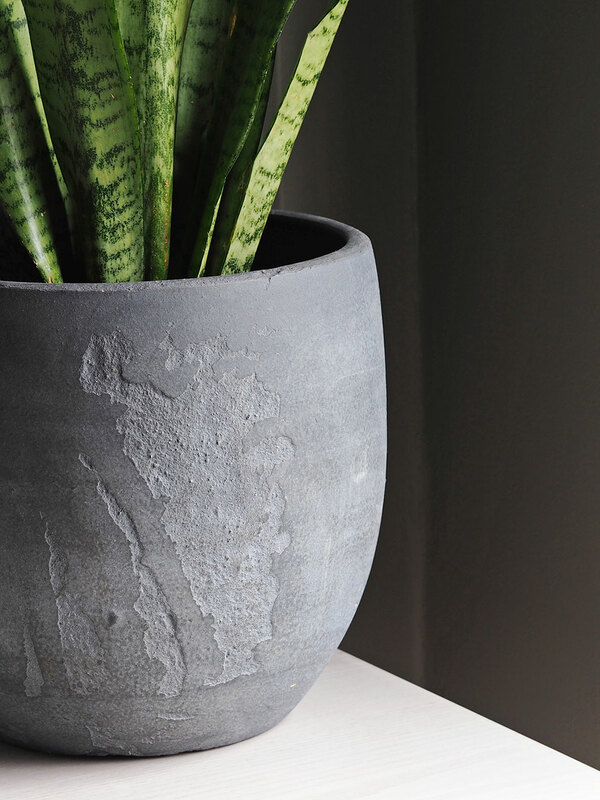 A trip to a Dobbies Garden Centre was the final step in finishing off this room and I picked up a selection of indoor plants including a really good sized fig and a snake plant for my desk (two of my favourites), and some really lovely textured concrete pots for them too. I was super impressed with their pots in fact - they had such a great range in loads of different sizes. If you can't already tell, I'm so happy with how the whole room has turned out - exactly as I'd imagined it. Maybe even better, and you can't ask for more than that! I didn't have any need for tiles in my room, but do check out Ca Pietra for the most stunning selection! Revamp Restyle Reveal wouldn't be possible without our incredible sponsors who we are so proud to have supporting us. Every single product I've received for my room is the most amazing quality that I would 100% have in my home - sponsored or not! 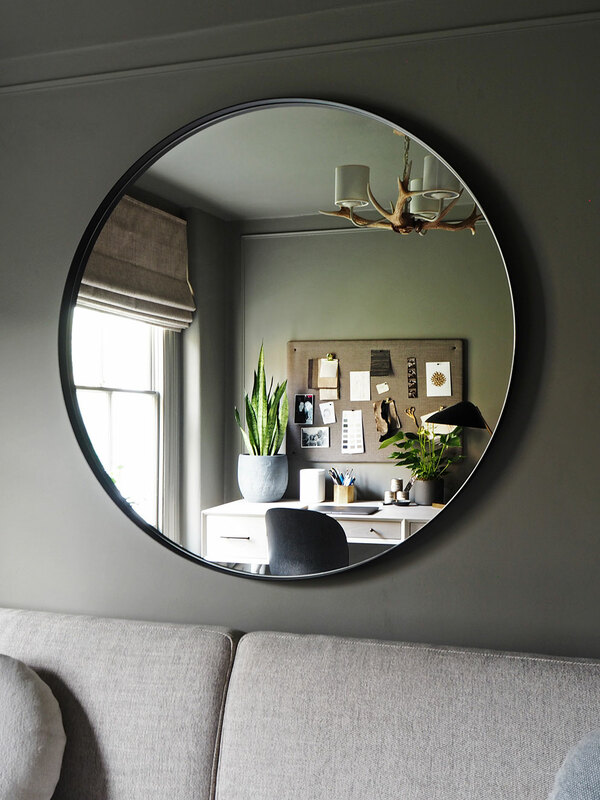 And of course, Lisa and I enlist the best of the best bloggers, with incredible flair and passion for interiors - not to mention a keenness for DIY. They're also *slight* gluttons for punishment as a huge amount of work and dedication is required to take part, so THANK YOU to all of you for being utterly brilliant. 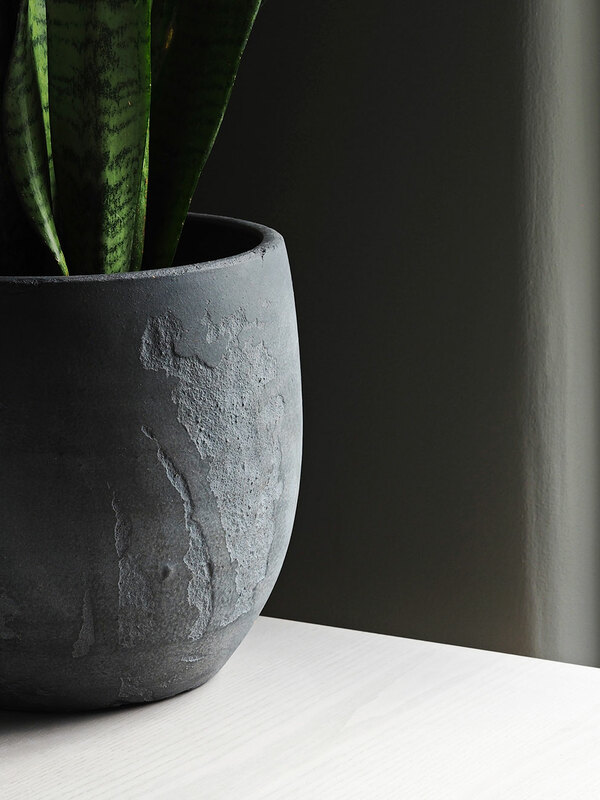 Please do go and check them all out - there are links to all of the other nine reveal posts below, but start with the lovely Ross & Ian over at Our 30's Fixer Upper to check out their gorgeous updated kitchen and entryway, and follow the blog hop on from there! Thanks so much for reading and for following along - we hope you've enjoyed it as much as we have! Right, I'm off to sleep for a week before starting my next project. Oh okay, maybe a glass of celebratory fizz first!